Is This A Goat Or A Sheep? It's Harder Than You Think : Goats and Soda True confession: Our editors mistook a sheep for a goat. Now we've learned a lot about how cool sheep really are. Maybe our blog should be ... "Sheep and Soda?" The photographer thought it was a goat. The photo editor thought it was a goat. Sure looked like a goat to the author of this post. It turns out to be a sheep, in Dakar, Senegal. So perhaps you noticed a post I wrote last weekend about how you know if your goat is happy. Yes, scientists do study that. The story had a cute picture of a goat at the top, taken by a photographer in Dakar, Senegal. The farmer told the photographer that the animal was his "goatie." And to our untutored eyes, it looked like a goat. 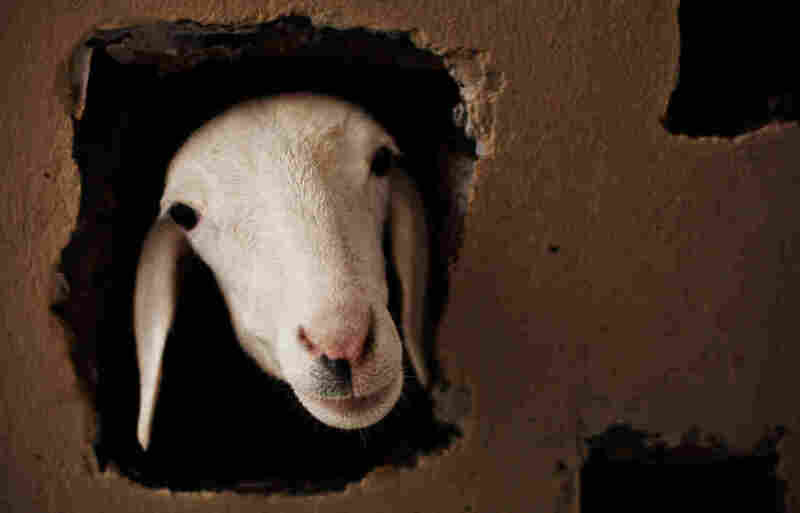 And then NPR's ruminant-wise Africa correspondent, Ofeibea Quist-Arcton, send me an e-mail with the subject: "MARC, THAT'S A PIC OF A SHEEP, NOT A GOAT!" Goats have sticky out small ears! These flappers surely belong to a sheep! Ofeibea was right. We were wrong. We took down the sheep photo and replaced it with a photo that was definitely, positively, 100 percent a goat. This humiliating experience made me eager to learn more about sheep and goats, and the differences between them. I turned to Cathy Dwyer, a professor at Scotland's Rural College, who does research on animal behavior and welfare. "I've worked on sheep quite a bit," she says. "Most of the last 20 years." So clearly we can't pull the wool over Dwyer's eyes. We started our interview by showing her the photo of the sheep we thought was a goat. I feel really stupid. I'm the editor of a blog called "Goats and Soda," and I can't tell a sheep from a goat. I can understand the difficulty. It's usually the tail that's the real giveaway. Sheep tails always go down; goat tails go up. But there's only a face to work from in the photo. Our ace NPR library did find that there's a sheep raised in Senegal called the Djallonke sheep, and it looks a lot like a goat. When you first saw the photo, would you have thought it was a sheep or a goat? I probably would have said a sheep. But I'm struggling to tell you why. It might be something about the ears, even just the location of the ears. They're a little bit lower in a sheep than in a goat. But it is hard to tell. That makes me feel a lot better. Some people say goats have more personality than sheep. Is that true? I mean, do sheep really act like, you know, sheep — kind of passive and hanging out with other sheep? Goats and sheep occupy slightly different niches. A sheep is predominantly a grazer, and a goat is a browser. Because they browse, goats spend a lot of time investigating things. They are forever nibbling on and eating things. So they have more exploratory, investigate behavior because of their feeding style. They appear to be more interactive with the environment, and they are very engaging animals. Because of that, I can completely understand why people think they're more intelligent or have more personality than sheep. When you're a grazing animal, like sheep, you spend a lot of time with your head down eating grass. That's much less interesting to people. So are sheep ... boring? Some are very fearful and withdrawn. Some are quite bold. Once sheep overcome their fear of you, they can be quite bold and confident animals — even though they appear to be just wooly blobs in the field. Are they followers rather than leaders? If you're a successful sheep it's because you've been evading predators. The way you do that is sticking together with other sheep. And following a dominant animal is a good way to stay alive. I bet a goat could beat up a sheep. I only remember one paper about goats and sheep fighting. When a goat wants to fight, it rears up on its hind legs. But the sheep butted the goat in the stomach. The sheep won. Which animal is easier to raise in the developing world? Actually I would say sheep. I think they're more robust than goats, so they survive better under the same conditions. Goats are particularly susceptible to cold weather. And goats are a little more susceptible to bacterial infections and viral diseases. What about in hot climates? Who has the edge? Both sheep and goats do pretty good when it's hot and dry. Goats do better than sheep when it's hot and humid. Then it's more difficult for sheep to dissipate heat by panting and [standing in the] shade because of their fleeces. Any other issues in the sheep versus goat debate? I guess sheep do offer a little more bang for the buck: milk, meat and wool. In Mongolia, sheep are used for portage as well. People dig out salt; the sheep carry it back. Would a goat do that? I could imagine the goat would just lie down and refuse to move.